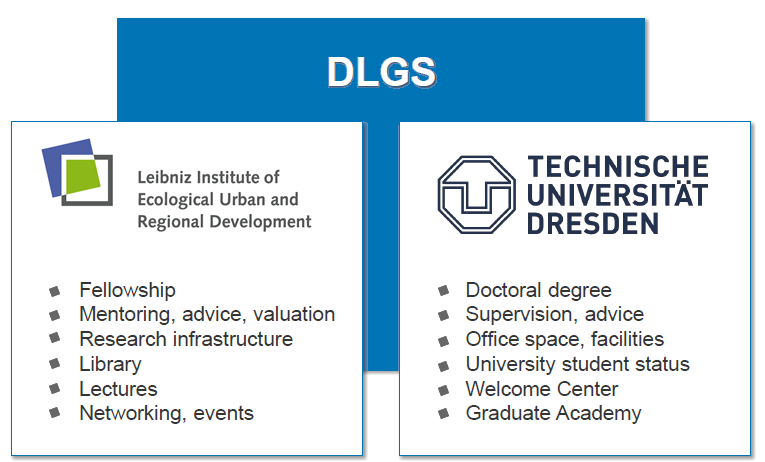 The Dresden Leibniz Graduate School (DLGS) is a joint activity of the Leibniz Institute of Ecological Urban and Regional Development (IOER), and the Technische Universität Dresden (TUD). The graduate school benefits from the strength of both ptypo3/index.php?route=/main&token=f5c2e491c554a55d1e669b22321cb71936fa25e6artners (figure 1). The mission of the DLGS is to prepare competent doctoral graduates to perform high quality research with the focus on regional and local development strategies by providing a flexible, interdisciplinary curriculum and orientation within the research process. The DLGS doctoral candidates are seen as early stage researchers who contribute to the creation of knowledge within the research areas of the IOER. (f) to foster candidates’ ability to effectively communicate their research findings to the scientific community as well as to practitioners.